Trying to get some coffeescript debugging going in WebStorm. You can see the setup for Mocha debugging in the attached screenshot. It looks like I'm setting it up correctly. I found a blog post (that doesn't use coffeescript though) that detailed how to set it up and I'm following that. Unfortunately I'm getting this cryptic error message. I've messed around a bit and never gotten any better results. Justin, please attach screenshot with the error message. This error was caused by execution of "C:\Users\jcollum\AppData\Roaming\npm\_mocha" as CoffeeScript source. 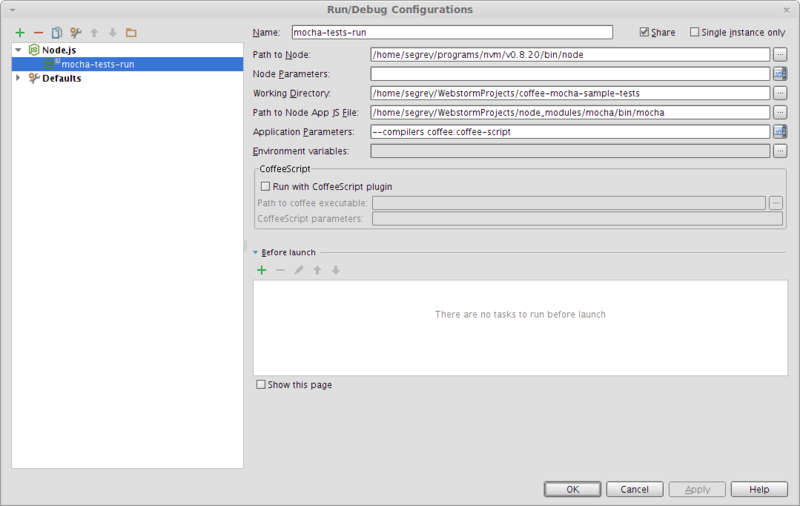 WebStorm 5 can't debug CoffeeScript Mocha tests for Node.js, but it can run them. Open the attached project in IDE and run "mocha-tests-run" Run Configuration. Thanks Sergey, that was helpful. Did you read that blog post? It's very recent and discusses debugging mocha tests in webstorm. The problem is that WebStorm 5 doesn't support CoffeeScript Node.js debugging. Seems like I should be able to get this to work by running it through a transpiler first. Suggestions? CoffeeScript Node.js code debugging will likely be available in WebStorm 6.0.x version (you'll need to run CoffeeScript sources through a transpiler first and also generate source maps).